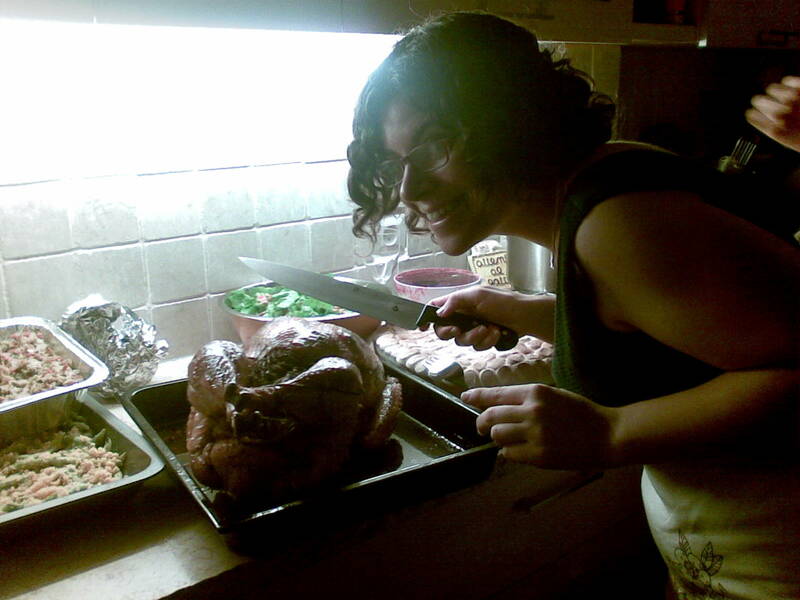 Despite the fact that I'm abstaining from meat, I love this photo from last year's Thanksgiving. Carving beautifully cooked turkey is a fabulous thing, indeed. My favorite holiday is rather difficult to celebrate in Israel. First, it’s not a holiday – it’s a workday. Second – Israelis don’t really get it or think it’s amusing that we celebrate. Third – the standard and necessary foods are difficult to find. This year we have found it particularly difficult to find Brussels sprouts, fresh or frozen, so it’s off the list. It’s also become prohibitively expensive to throw such a dinner for two single gals, so we’re having a cocktail party tonight with a few must-have Thanksgiving foods. Pumpkin and apple pies will be thrown into the oven in a couple hours, mulled wine is on the agenda, and my sister is planning a green bean dish (thank you Martha for last year’s awesome recipe), a cranberry dish, and a spiced almond thingy. I’ve got some of my winery’s best light young wines, the Galil Rose, and the Golan Gamay Nouveau, both chilling in the fridge. As guests were instructed on the BYOB nature of the evening, there should probably be more than enough nibbles and alcohol to go around. Now to get down to the housecleaning and cooking… Ugh! In other news, grad school applications have taken on a lighter note. Still intense, but I’ve realized as they’re the most important thing in my life right now, I’d better get over myself and put all my energy into them. The fact that I found three incredible people who I respect immensely to write letters of recommendation for me and gave me words of encouragement has bolstered my confidence. Whether I get in or not, some pretty amazing academics think that I belong in the academy. It will happen sooner or later. 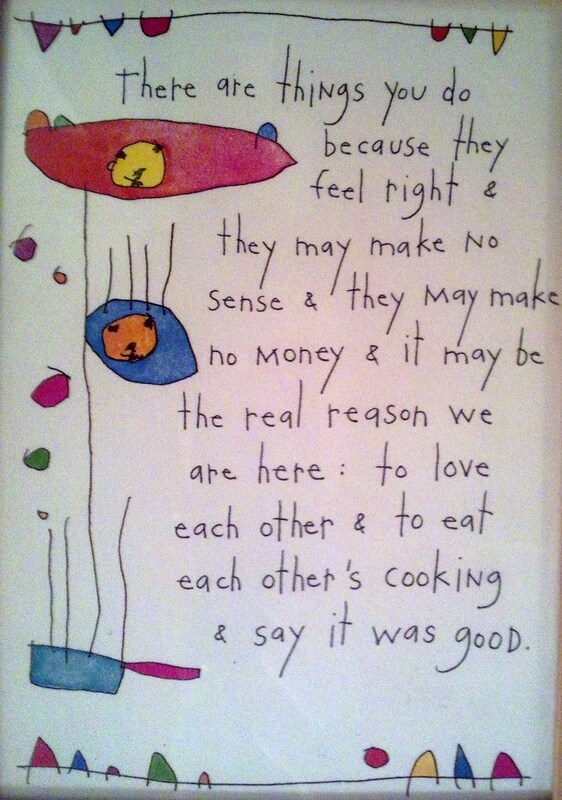 I will leave you with a picture-poem by Brian Andreas, my absolute favorite of his. There is much to be thankful for this year. You will be missed as every passing year. For some reason that poem brought a tear to my eye. There’s just something about these simplicity poems that make you face your own tendency to get overly attached to your anxieties and realize that you can also simply let go of them. Reminds me somewhat of Mary Oliver. Annael – that poem almost always makes me cry. I keep it framed by my bed. It’s hard to remember how simple it really is. Or should be. Thanks for the link. I loved “The Visitor. You missed a helluva party…want me to bring pumpkin pie to university next week…? Happy Thanksgiving Irene! That Gamay Nouveau was really nice!